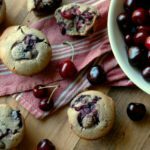 Paleo cherry buckwheat breakfast muffins will wow your family with fluffy, soft texture, and juicy sweet cherries! Our family has been enjoying Michigan cherry season! 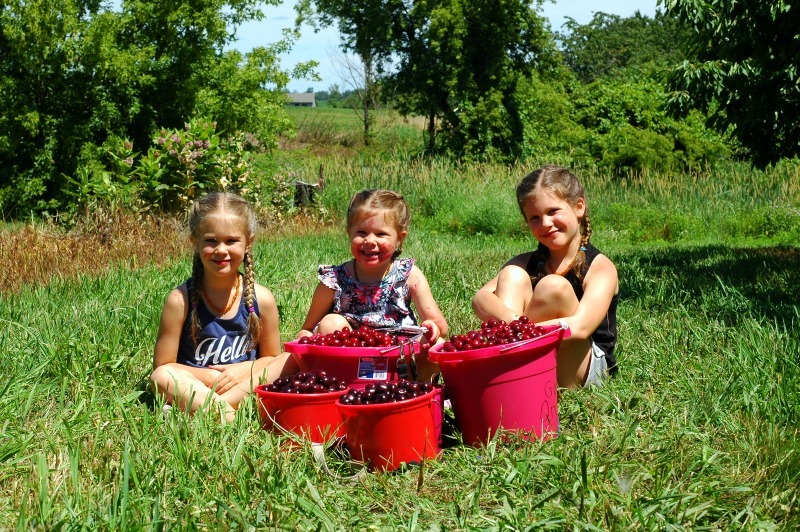 We have the Cherry Festival up in Traverse City on our bucket list to do as the girls get older (and easier to travel with! ), but in the meantime, we are literally surrounded by cherry farmer’s where we live right along the Lake Michigan shoreline. 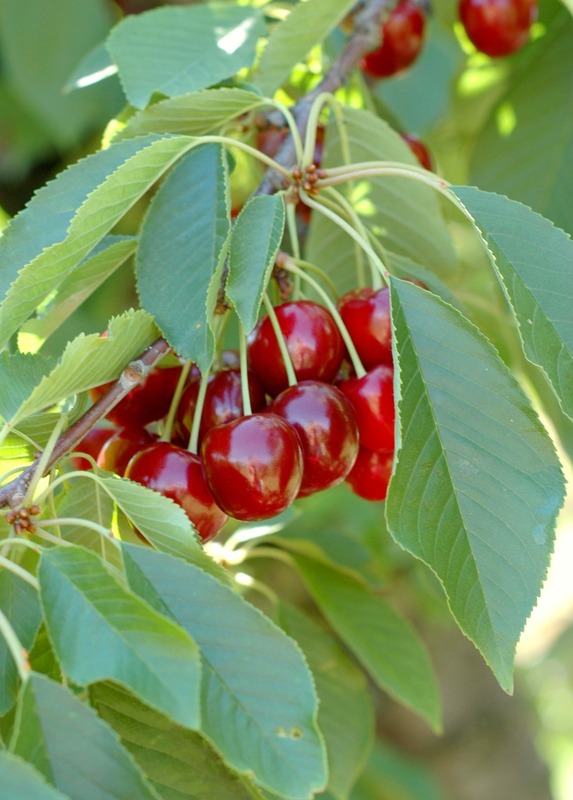 There is just something about the weather and soil in this area that is the perfect growing condition for cherries! Hands on learning where their food comes from…priceless. 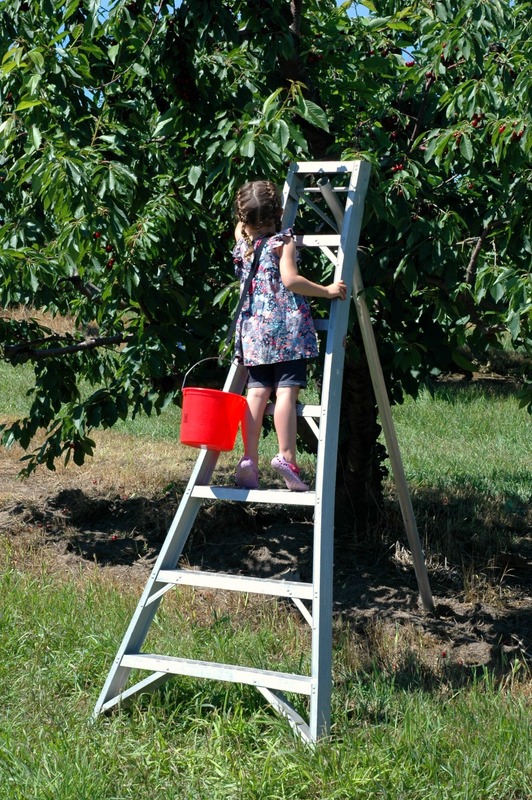 There are some great places around us that offer U-Pick cherries so the girls can get right in there and see how their food is growing. It just doesn’t get any better than that! We are grateful for the experience, and the girls look forward to it every year. 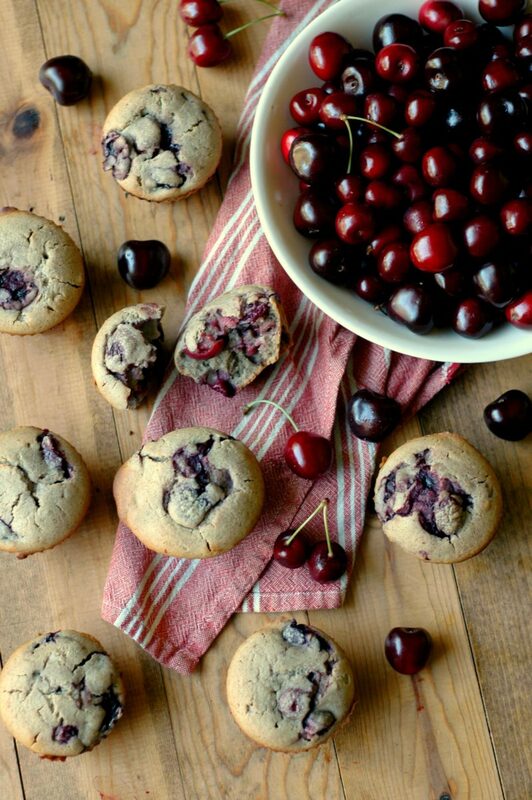 I guess I’m feeling a bit adventurous this year, as I have been doing just about all new recipes with my cherries this season! 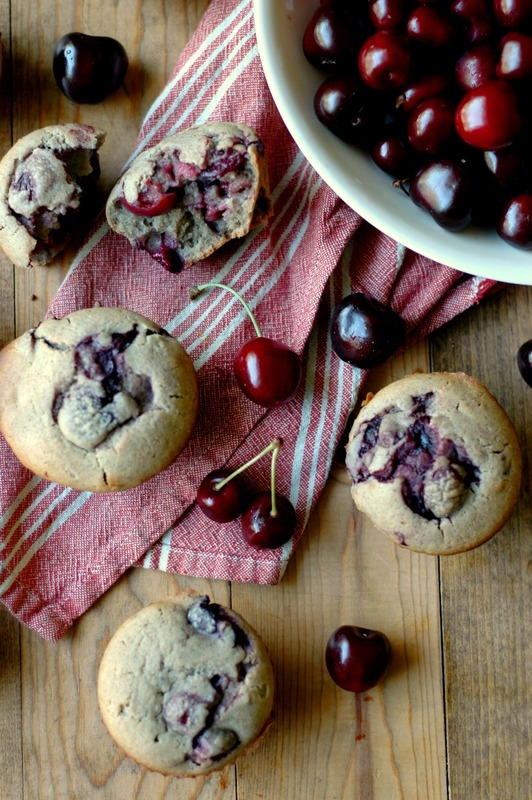 We perfected cherry jam over the weekend, and this week have been enjoying multiple batches of these cherry buckwheat muffins! After the first attempt, I just knew I had to get these just so and share them, because they are so good and very satiating. 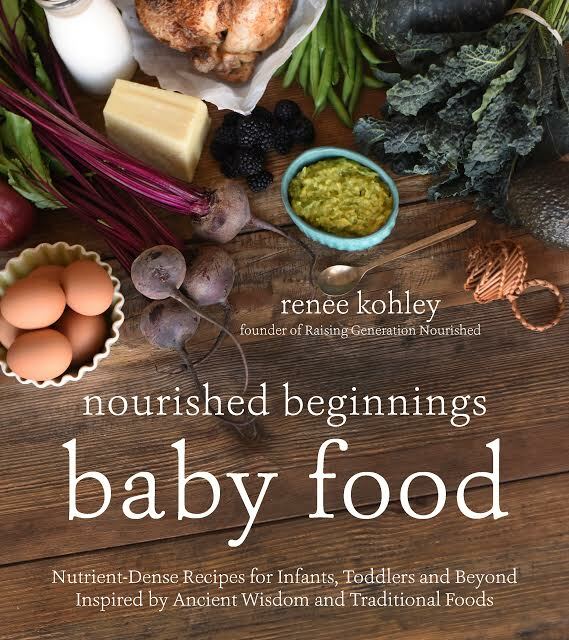 Those of you following me for very long know that one of my mottos when feeding kids is “make every bite count.” In other words, little kids have small stomachs – stop thinking fillers and start thinking nutrient dense fueling. Fueling kids with food that satiates and nourishes keeps them focused longer – and keeps you from having the fix snacks every hour! What is buckwheat flour, anyway? Despite the sound of it’s name, buckwheat flour is ground up buckwheat seed – its a seed, not a grain! Many people that cannot tolerate gluten or grains can tolerate buckwheat, and it has a host of nutritional benefits. Buckwheat has an impressive protein content and is packed with essential minerals our bodies need to function at it’s best. Even if you can tolerate gluten/grains, it is a good idea to rotate your food around. Using the same flour day in and day out in your baking will wear on the gut. Change things up a little! 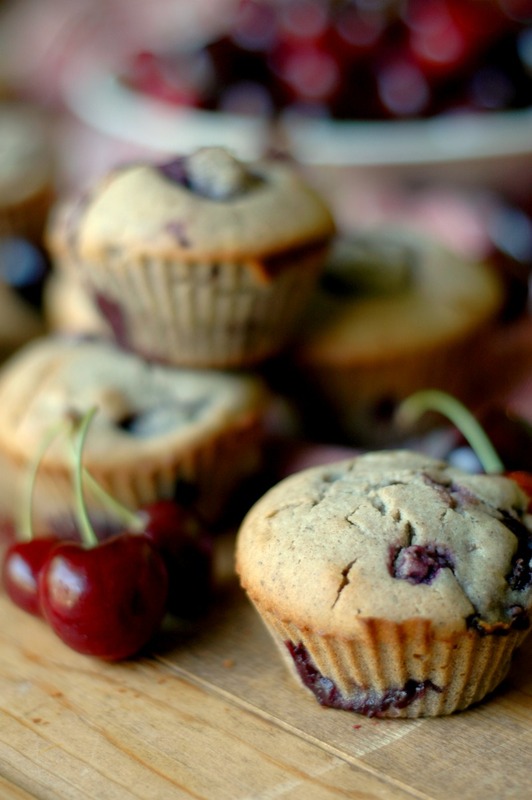 The buckwheat gives these muffins a mildly sweet, nutty flavor that goes so well with cherries! Cassava flour is a newer gluten/grain free flour to my kitchen in the last 9 months. I’ve been playing around with it a lot, and this is my first real recipe on the blog using it! I have fallen in love not only with the ease of baking it provides and incredible finished texture to baked goods, but also the nutritional benefits. Specifically the prebiotic fiber. Cassava flour is dried and ground up cassava root. It is a tuber vegetable and it is loaded with these amazing starches that actually feed the beneficial bacteria in your gut. 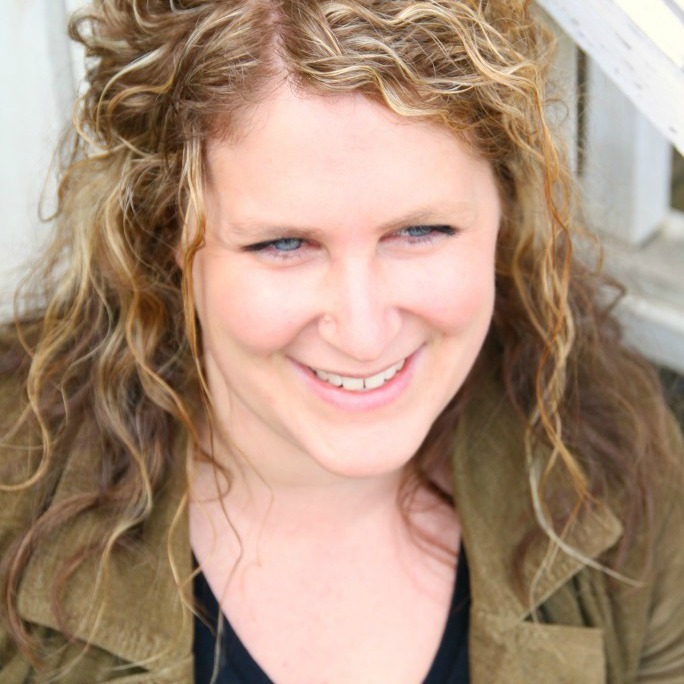 We are learning more about prebiotic importance – it isn’t enough to just populate your gut with probiotics. They are living organisms and need “food” to feed on. That is where prebiotic fiber in foods such as the cassava root come in! More than just a muffin! 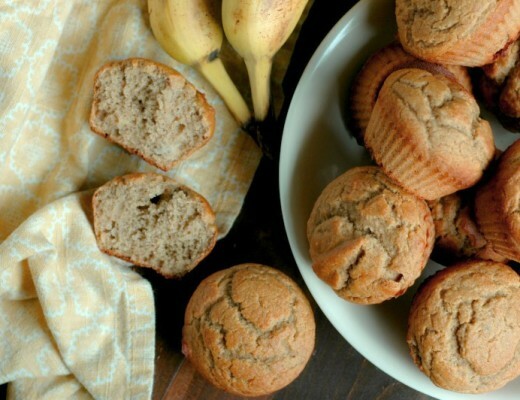 With all of these amazing ingredients, these muffins are more than just a starchy filler to the breakfast plate. They are filling and satisfying – and will please even the biggest kid muffin critic in texture and taste – I’m sure of it! They are SO soft. It really feels like all purpose flour was used to make them. And you can’t beat juicy, sweet cherries in every bite! ¼ -1/3 cup raw honey If you have older kids used to sweeter things, you can bump this up to ½ cup. If you have really little guys in the house, I’d keep it on the low side – it may taste light on the sweetness to you , but they don’t have a frame of reference for that yet! You can always drizzle a bit of honey on the muffin you are eating. The night before you want to make the muffins, put the buckwheat flour, coconut milk, sea salt, and lemon juice in a medium mixing bowl, combine, cover the bowl with a towel, and let it sit overnight (8-9 hours). This soaking process breaks down the phytic acid in the buckwheat seed so it is easier on the gut, and also makes the nutrients in the buckwheat more available to absorb into the body. When you are ready to make the muffins, preheat your oven to 350 degrees. 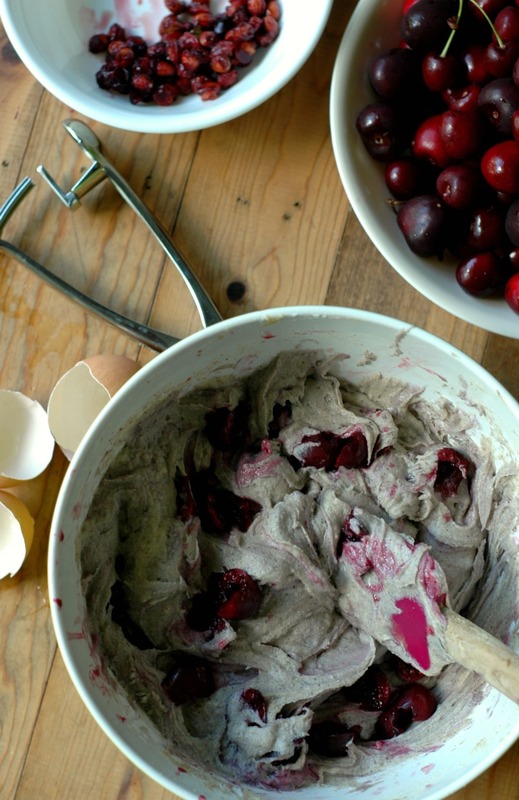 Add the rest of the ingredients EXCEPT the cherries into the bowl, and stir to combine, and then fold in the cherries. Scoop the batter into silicone muffin cups (my personal preference), or paper muffin cups, and bake at 350 degrees for 30 minutes. Let the muffins cool 10 minutes before taking them out of the muffin tin to finish cooling on a cooling rack. These are so lovely Renee! I can’t wait to make some. I need to get some buckwheat flour, I haven’t used that in so long and forgot how much I enjoy the flavor. LOVE all of those gorgeous cherries you got! Made these with fresh ground hard wheat flour in place of the buckwheat and the cassava. Still soaked overnight. Also used flax eggs in place of the eggs. Doubled the recipe then split in half, added cherries to one bowl and blueberries with lemon zest to the other. Both turned out great! Awesome Amy! Thank you for sharing how to do it with the wheat! I was just about to ask if the recipe works with flax eggs….so glad to see it does! You don’t happen to have any idea how to make this recipe if you only have buckwheat seeds do you? Do you suppose I could soak like your recipe says and then just blend it up in the morning? But then i’m not sure how much Buckwheat seed to use. these look amazing. I love that your kids get to experience the harvest and prep! Some of my fave childhood memories are berry picking or canning with my grandparents! YESSS I just bought a crapload of cherry – now I know what to do with them! These muffins look so delicious! I love how packed with cherries they are. I have never had buckwheat flour, but you are convincing me to try it. Ooooh. I was wondering what muffin recipe I’d make for our camping trip this weekend and I think this will be it! Looks so good! Any other substitute for the cassava flour/namaste? Hi Diana! I think tapioca flour would work here. 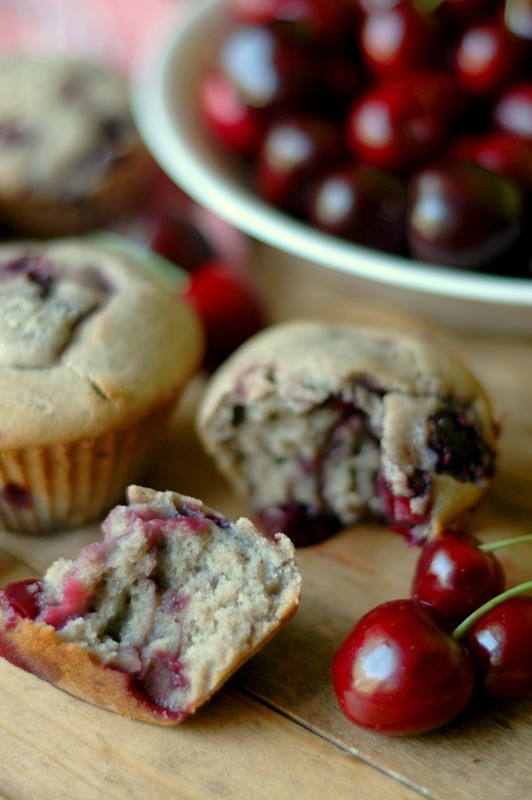 Love using cherries in breads and desserts! These look like a delicious breakfast treat. DEFINITELY did not know that buckwheat was a seed and not . type of wheat. That’s good news! 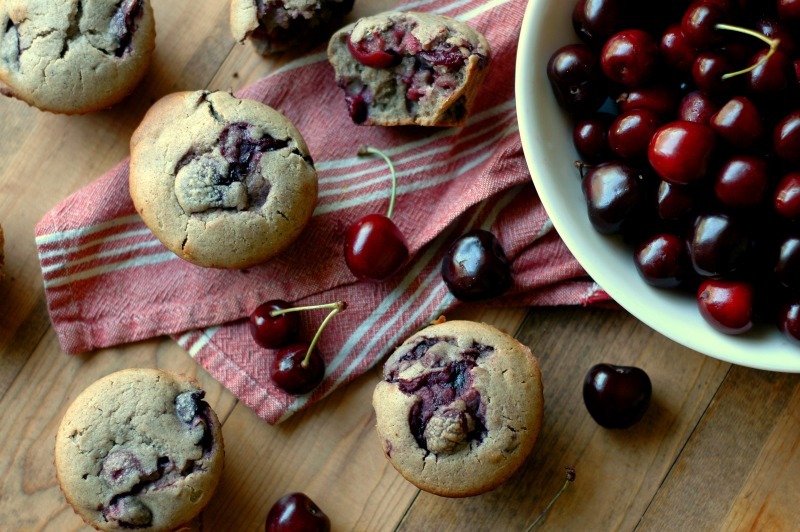 Love these buckwheat cherry muffins ! So moist and delicious. Shared ! 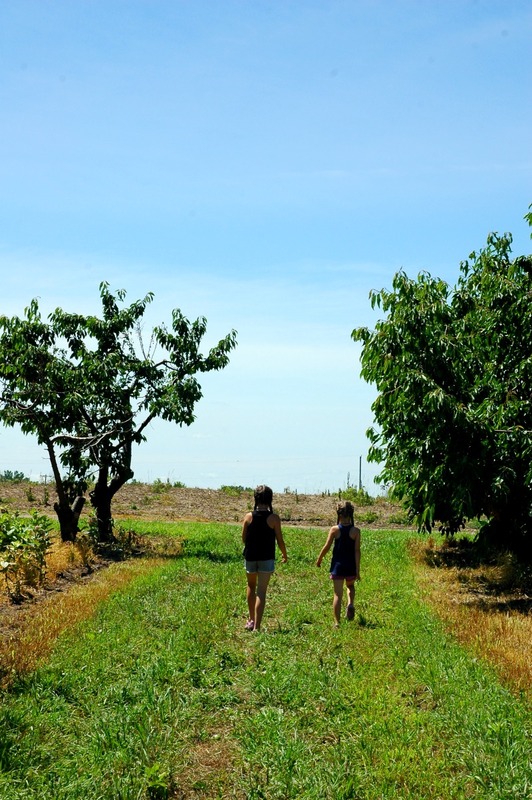 We’ve been loving our local cherry season too, and I absolutely love how you get your kids involved in where their food comes from! This looks fantastic! Any suggestions for only using cassava flour for this? 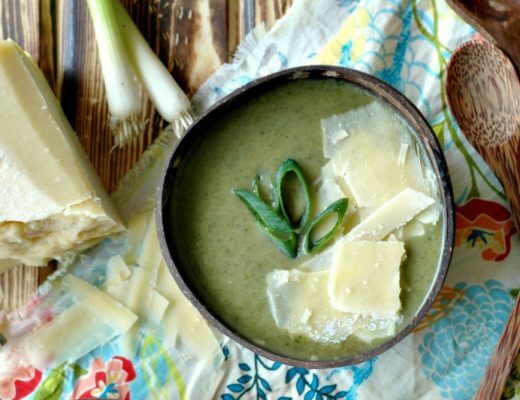 Do you have any suggestions for a substitute for coconut almond milk or dairy. And for coconut oil? I have food allergies and would love to try these. Hi Tracey! I really think water would be fine for the soaking – that is what I would try. And for the fat, you can use softened lard or ghee 🙂 I hope that helps! Should you let it soak overnight on the counter or in the fridge? If we don’t have buckwheat flour what would you recommend as a replacement? Hi Kira! The buckwheat is the main ingredient in the muffins, so I have not tried any other flours before! If you try something you love, let us know!